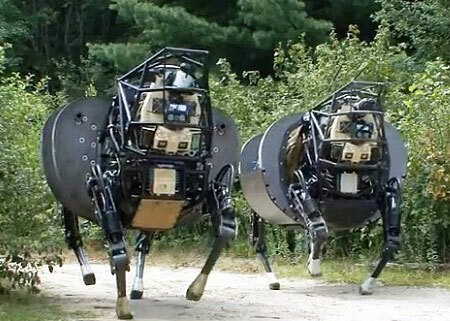 I’m not exactly sure what you’d call a group of Boston Dynamics’ LS3 “AlphaDog” robotic pack animals. A herd, I guess? Two LS3s might not quite constitute a herd, but it’s certainly impressive to see both of them in operation, and just as impressive is this demonstration of some new features including autonomous person following and a much quieter engine.